The town of Mackenzie, British Columbia, was named after the famous explorer Alexander Mackenzie, who camped near the townsite on his epic journey to the Pacific in 1793. Mackenzie, located within BC's Northern Rocky Mountain Trench, is known as the "Gateway to Williston Lake" the largest man-made lake in Canada. Once in Mackenzie, you don't have to travel far to experience the natural unspoiled British Columbia wilderness that provides ample opportunities for hiking, mountain biking, camping, wildlife viewing and photography. Surrounded by a variety of lakes, rivers and streams, this area is a fisherman's paradise. Visit picturesque Morfee Lake, located minutes from downtown, and enjoy boating, canoeing, kayaking, fishing, swimming or just lounging on the sandy beach. Enjoy nine scenic holes of golf on a pristine course, or practice your swing at the Mackenzie Golf & Country Club. Avid snowmobilers will enjoy enviable snow conditions, porch to powder experience, and a diverse trail system. 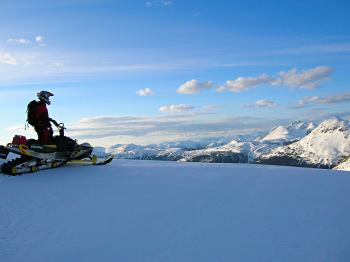 Guided snowmobile tours are available. Winter fun continues with skiing at Little Mac Ski Hill, located right in town. Check out our numerous groomed and lit cross-country ski trails, which leave right from town. Visit Powder King Ski Resort, only a 40 minute drive, for some world class skiing conditions. Don't forget to check out the Mackenzie & District Museum, Arts Centre, Leisure Services Complex and the World's Largest Tree Crusher. With everything there is to see and do in Mackenzie, The Sky's The Limit. Access: Mackenzie, BC, is 190 km (118 mi.) 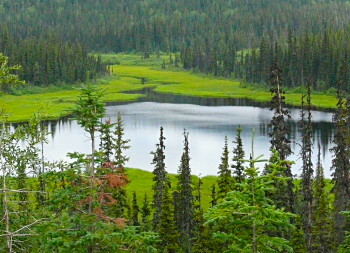 north of Prince George and 188km (117 mi.) west of Chetwynd on British Columbia Hwy 97. Accommodations: The visitor can choose between motel/hotel accommodations, bed and breakfasts, or campgrounds.